Blue Glaze & Cleaner Foam Pad -Unique Composition complements all glazes and light surface cleaners perfectly delivering a super fine finish for use with ultra fine polishes life FP or any glaze. Blue Glaze & Cleaner Foam Pad -Unique Composition complements all glazes and light surface cleaners perfectly delivering a super fine finish for use with ultra fine polishes life FP or any glaze. 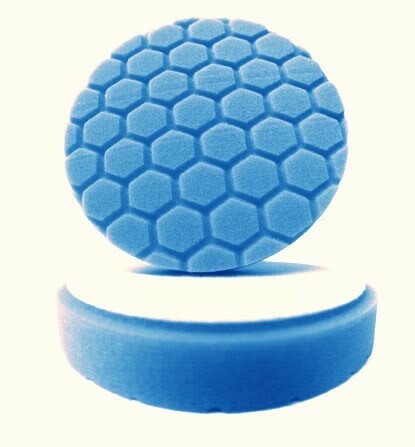 Hex-logic The Latest Innovation In Polishing and Buffing Pads. Hex-logic pads are engineered and developed for today's pickiest detailing professionals. Engineered, developed and tested to specific requirements of our OEM clients these pads utilize the best foams from around the world and the latest of testing and research and development including Chemical Guys own Hex-Logic Pads.